Cherry Hill Township and the AARP have once again partnered to offer seniors free tax-preparation assistance from 10 a.m. to 2 p.m. every Tuesday and Friday until April 14. Tax-Aide volunteers will help residents over 55 prepare their 2014 state and federal tax returns, as well as Homestead Benefit Credit and Property Tax Reimbursement forms. No appointments are necessary. All tax-prep sessions will take place in the N. John Amato Council Chambers (Room 208) at Town Hall. Electronic filing and direct deposit are available to help expedite returns. Click here for more information, or call the AARP directly at (888) AARP-NOW. On Wednesday, we had a very special group of visitors to Town Hall, when Cooper Elementary School’s EDCC Kindergarten class joined us for a tour of our municipal offices and the Cherry Hill Police Department. The children enjoyed a tour of police headquarters, dispatch, the squad room, the Chief’s Office, and a look inside a police car. Back at my office, I answered questions about my job as Mayor, and what it’s like to run our wonderful community. Visiting with our youngest residents is always a pleasure, and a highlight for myself as well as the kids. Thanks to the teachers at Cooper School for arranging the visit! Earlier this week, I joined Cherry Hill resident Kyle Dixon at the YALE School as part of his "You're Never too Young To Achieve Greatness" book tour. At just 13 years old, Kyle has an amazing story to tell. He’s already a published author, whose book “Jay Bubblebee,” about a bee without wings, teaches an important lesson for all of us. While Jay Bubblebee’s disadvantage would keep the average bee down, he is determined to "beecome" great. On his book tour, Kyle encourages school children around South Jersey and Philadelphia to go beyond who they are, and not wait to be great. Thanks to Kyle for inviting me to join him on Thursday. He’s an inspirational young man and a wonderful example for people everywhere! The continuous freezing/thawing cycle of winter can wreak havoc on road surfaces, and inevitably leads to a spike in potholes popping up across town. The Department of Public Works is responsible for the repair and maintenance of nearly 260 miles of municipal roads, and has dedicated crews assigned to the task of filling these potholes as quickly as possible. You can report an area of concern online by clicking here, or by calling Public Works directly, Monday through Friday, at (856) 424-4422. Please be sure to include as specific a location as possible. Remember that some roads in Cherry Hill are maintained by Camden County and the New Jersey Department of Transportation. 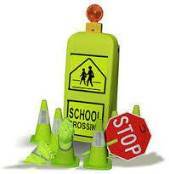 Click here for a list of roads and contact information for other entities. Drive safely! Please join me in congratulating the 2015 officers of the Cherry Hill Super Seniors club, who officially took the oath of office earlier this week. This year’s group leaders are Janice Walker-White, Barbara Pyshchenko, Paula West, Iris Teibel, Dr. James Brown, and Bette Fava-Longmore. The Super Seniors meet Wednesdays from noon to 4 p.m. at the Carman Tilelli Community Center, and enjoy activities including bingo, cards, trips and guest speakers. For more information, contact the Recreation Department at (856) 488-7868, or club president Janice Walker-White at (856) 795-4515. More than 200 local seniors enjoyed our latest Luncheon with the Arts, featuring food and entertainment from Philly Cuzz, last Friday at the Katz JCC. 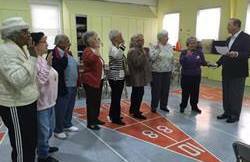 This collaborative program between the Cherry Hill Arts/Senior programs and the JCC is part of the Township’s Luncheon with the Arts Series, which offers residents 55 and older lunch and entertainment throughout the year at the Croft Farm Arts Center. Two special events are held at the JCC in January and July. Thank you to the JCC for hosting another wonderful afternoon for all. To learn more about the Arts Board and for a schedule of events, visit http://cherryhillarts.blogspot.com/. This week, I welcomed M&T Bank into Cherry Hill, joining company officials at the grand opening of the bank’s newest location, in the Woodland Falls Corporate Park on Route 38. 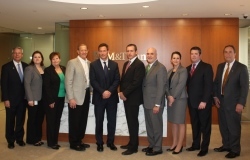 The office will offer customers commercial banking, wealth management and mortgage services, and is part of an overall plan by M&T to expand its footprint throughout New Jersey. Please join me in once again welcoming M&T into our community, and in wishing the company and its employees continued growth and success in the months and years to come. Come join us a screening of the 1980 thriller/psychological horror film, "The Shining," along with a discussion by Joseph Greenberg, independent filmmaker and professor of Film Scenario Writing and Advanced Film Production at Rowan University. Do you knit, crochet or do needlework of any kind? Bring your own needles and any other supplies you need to sit and work on a your project with other crafters. This is not an instructional class. The Needlework Guild meets on the second and fourth Tuesday of every month. No registration required. Do you like reading comics and graphic novels? Do you want to try drawing your own? Join other kids each month to discuss a different series and draw your own comics. We'll provide the supplies, you provide the creativity. Click here to register. Improve literacy skills and encourage school-readiness with this story time for children ages 3-6 featuring stories, songs, finger plays and a craft. Limited spots available, click here to reserve a seat today! Morning session (10 a.m.) also available. In honor of Chinese/Asian New Year, join author Q. Edward Wang for a discussion about his new book, "Chopsticks." Chopsticks have become a quintessential part of the Japanese, Chinese and Korean culinary experience across the globe, with more than one-fifth of the world's population using them daily to eat. Attend this event for a look into the vibrant history of chopsticks as Wang charts their evolution from a simple eating implement in ancient times to their status as a much more complex, cultural symbol today. Free and open to the public. No registration required. Traditional Chinese Medicine is a healing practice with over 4,000 years of history. Acupuncture, acupressure, and other therapies have found their way into common and medically accepted usage in the Western world. Speaker Glenn Gruby, an experienced practitioner and educator from Camden County Acupuncture, will speak on the ancient practice and modern usage as well as answer your questions. No registration required. Meet local people who love poetry as much as you do. Inspiring discussions about poetry, and poetic forms and styles provide an opportunity to read aloud and discuss poems - one’s own or another’s. With new topics every month, participants explore this literary art and learn from each other. Listeners always welcome! No registration required. Cherry Hill Township and the AARP have once again partnered to offer seniors free tax-preparation assistance from 10 a.m. to 2 p.m. every Tuesday and Friday until April 14. Tax-Aide volunteers will help residents over 55 prepare their 2014 state and federal tax returns, as well as Homestead Benefit Credit and Property Tax Reimbursement forms. No appointments are necessary. All tax-prep sessions will take place in the N. John Amato Council Chambers (Room 208) at Town Hall. Electronic filing and direct deposit are available to help expedite returns. Click here [http://www.cherryhill-nj.com/CivicAlerts.aspx?AID=663] for more information, or call the AARP directly at (888) AARP-NOW. 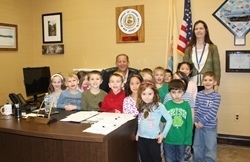 On Wednesday, we had a very special group of visitors to Town Hall, when Cooper Elementary School’s EDCC Kindergarten class joined us for a tour of our municipal offices at the Cherry Hill Police Department. The children enjoyed a tour of police headquarters and dispatch, the squad room, the Chief’s Office, and – the highlight of the afternoon for many of the kids – look inside a police car. Back at my office, I answered questions about my job as Mayor, and what it’s like to run our wonderful community. Visiting with our youngest residents is always a pleasure, and a highlight for myself as well as the kids. Thanks to the teachers at Cooper School for arranging the visit! Earlier this week, I joined Cherry Hill resident Kyle Dixon at the YALE School as part of his "You're Never too Young To Achieve Greatness" book tour. At just 13 years old, Kyle has an amazing story to tell. He’s already a published author, whose book “Jay Bubblebee,” about a bee without wings, teaches an important lesson for all of us. While Jay Bubblebee’s disadvantage would keep the average bee down, he is determined to "beecome" great. On his book tour, Kyle encourages school children around South Jersey and Philadelphia to go beyond who they are, and not wait to be great. Thanks to Kyle for inviting me to join him on Thursday – he’s an inspirational young man and a wonderful example for all of us! More than 200 local seniors enjoyed our latest Luncheon with the Arts, featuring food and entertainment from Philly Cuzz, last Friday at the Katz JCC. This collaborative program between the Cherry Hill Arts/Senior programs and the JCC is part of the Township’s Luncheon with the Arts Series. Residents 55 and older can enjoy lunch and entertainment throughout the year at the Croft Farm Arts Center, with special events at the JCC in January and July. Thank you to the JCC for hosting another wonderful, fun afternoon for all involved. 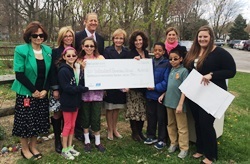 To learn more about the Arts Board and for a schedule of events, visit http://cherryhillarts.blogspot.com/ [http://cherryhillarts.blogspot.com/] . Come join us for a lecture and screening of the 1980 thriller/psychological horror film, "The Shining." Joseph Greenberg, independent filmmaker and professor of Film Scenario Writing and Advanced Film Production at Rowan University, will join us to talk about the Stanley Kubrick film and Stephen King novel. Do you like reading comics and graphic novels? Do you want to try drawing your own? Join other kids each month to discuss a different series and draw your own comics. We'll provide the supplies, you provide the creativity. Click here [http://host6.evanced.info/cherryhill/evanced/eventsignup.asp?ID=6235&rts=&disptype=&ret=eventcalendar.asp&pointer=&returnToSearch=νm=0&ad=&dt=mo&mo=2/1/2015&df=calendar&EventType=ALL&Lib=&AgeGroup=ALL&LangType=0&WindowMode=&noheader=&lad=&pub=1&nopub=&pa] to register. Improve literacy skills and encourage school-readiness with this story time for children ages 3-6 featuring stories, songs, finger plays and a craft. Limited spots available, click here [http://host6.evanced.info/cherryhill/evanced/eventsignup.asp?ID=6254&rts=&disptype=&ret=eventcalendar.asp&pointer=&returnToSearch=νm=0&ad=&dt=mo&mo=2/1/2015&df=calendar&EventType=ALL&Lib=&AgeGroup=ALL&LangType=0&WindowMode=&noheader=&lad=&pub=1&nopub=&pa] to reserve a seat today! Morning session [http://host6.evanced.info/cherryhill/evanced/eventsignup.asp?ID=6251&rts=&disptype=&ret=eventcalendar.asp&pointer=&returnToSearch=νm=0&ad=&dt=mo&mo=2/1/2015&df=calendar&EventType=ALL&Lib=&AgeGroup=ALL&LangType=0&WindowMode=&noheader=&lad=&pub=1&nopub=&pa] (10 a.m.) also available. In honor of Chinese/Asian New Year, join author Q. Edward Wang for a discussion about his new book, "Chopsticks." Chopsticks have become a quintessential part of the Japanese, Chinese and Korean culinary experience across the globe, with more than one fifth of the world's population using them daily to eat. Attend this event for a look into the vibrant history of chopsticks as Wang charts their evolution from a simple eating implement in ancient times to their status as a much more complex, cultural symbol today. Free and open to the public. No registration required.